There are many London bus routes that are great for sightseeing. 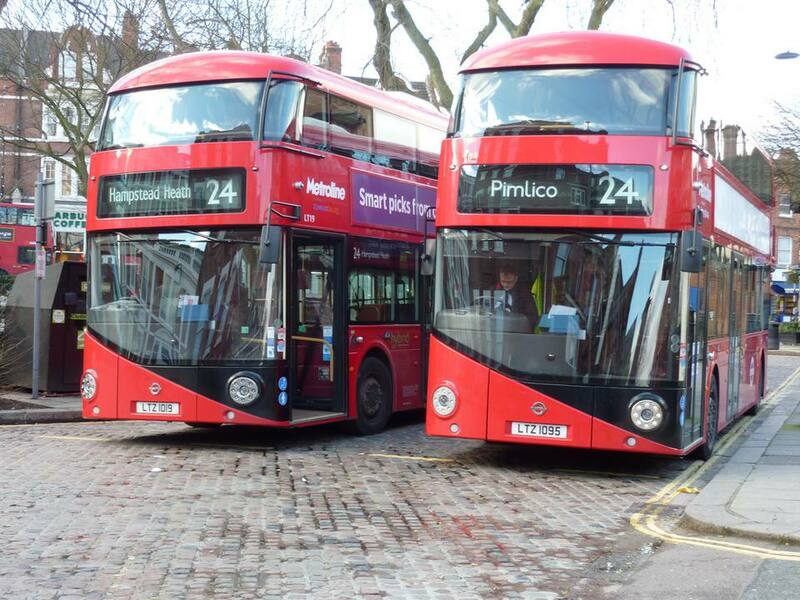 The Number 24 route is among the more popular, as it starts in Hampstead in North London, passes through Central London, and ends in Pimlico near Victoria station. The total tour takes about an hour. The route starts in South End Green at the junction of South End Road and Pond Street. It's a short walk from Hampstead Heath Station on the London Overground. While there, have a walk on Hampstead Heath, visit 2 Willow Road (the former home of architect Ernö Goldfinger) or stop for a pub lunch at The Roebuck, which has a lovely pub garden. The no.24 bus is a new Routemaster bus. The buses are fully accessible and have three entrances so boarding and alighting are quick and efficient. The first section of the route is quite residential but in 10 minutes in so, the bus reaches Camden where it turns left onto Chalk Farm Road. The Stables Market is on the right and the Camden Town railway bridge goes over the road ahead. Take a quick look up Camden High Street before the bus turns left onto Hawley Road. Look out for The Hawley Arms pub on the right. This was Amy Winehouse's favorite pub. Soon it's right onto Camden Road and you are near Camden Town tube station. In this direction the bus doesn't go along the one-way Camden High Street but, of course, if you do the route in reverse you will get to see the famous Camden Markets that line the road. If you stay on the bus, it now turns left and takes a route parallel to the lower section of Camden High Street. At Mornington Crescent you'll see the lovely Leslie Green-designed tube station and as the bus goes left by the station look right to see the delightful Art Deco building that served as the Carreras Black Cat Cigarette Factory, a design that was heavily influenced by Egyptian styles. The bus then joins Hampstead Road and heads down towards Central London. Straight ahead, you'll see BT Tower before reaching Euston Road and Warren Street tube station. BT Tower is a communications tower and a striking monument at 177 meters tall. It once had a revolving restaurant that was open to the public but it sadly closed in the 1970s. The bus goes round to Gower Street with UCL (University College London) on the left, where you can get off to see Jeremy Bentham (inside) and look to the right to see the Grant Museum. As you pass Bedford Square (on your right), admire the Georgian architecture and the old-fashioned lamp posts. Half an hour into your journey and you'll reach the stop for Great Russell Street which is where you get off for the British Museum. It's just off to the left (the bus won't pass it). Look ahead, and to the left, and see the James Smith & Sons umbrella store which has been there since 1857. The bus goes straight across New Oxford Street, towards the Oasis Sports Centre and Covent Garden, before turning right to join Charing Cross Road. The tall skyscraper ahead is Centre Point. It has 34 floors and there's a viewing gallery at floor 33. To reach Charing Cross Road, the bus goes down Denmark Street which is full of musical instrument shops. The bus turns left to join Charing Cross Road and soon reaches Cambridge Circus, the junction with Shaftesbury Avenue, where you'll see the Palace Theatre on your right. Then, on to Trafalgar Square. You'll first see the National Portrait Gallery on your right and then St Martin-in-the-Fields church on the left before the whole of the square comes into view on the right. Look for the well-disguised police box, when at the Trafalgar Square/Charing Cross Station bus stop, before the bus heads down Whitehall and you'll have the magnificent Big Ben ahead. Look right to see Horse Guard's Parade where the mounted cavalry can be seen (and flocks of tourists taking photos of them). On the left is Banqueting House, which has a magnificent ceiling in the Hall painted by Rubens, and is the only remaining complete building of Whitehall Palace that once lined both sides of this street in the late 1500s. Notice the armed policemen and the black railings on the right and that's Downing Street, where the Prime Minister lives at number 10. A quick look to the left and you'll see the London Eye, which is on the other side of the river Thames. And then you reach Parliament Square with the Houses of Parliament and Big Ben to your left. The bus goes around the square and soon Westminster Abbey is on your left with the Supreme Court to your right. The bus now goes along Victoria Street where there's not a lot to see but do look left just before Victoria Station and you'll see Westminster Cathedral which has a tower viewing gallery 64 meters (210 feet) above street level. It doesn't go into Victoria bus station but instead goes down the side of the station, along Wilton Road which has plenty of restaurants and cafes. Then, it turns left onto Belgrave Road, and you're in Pimlico, so it is best to get off at the stop for Pimlico station, on Lupus Street, and it's a 5-minute walk to visit Tate Britain.